Our playground including swing, slide, sand box, mini tractor, foosball and more is not the only feature your children will appreciate during their farm holidays. Around the farm in Neustift, kids and teens can go on a discovery tour and also explore the area without constant supervision. Collecting pine cones or mushrooms , watching animals – numerous adventures await them here. 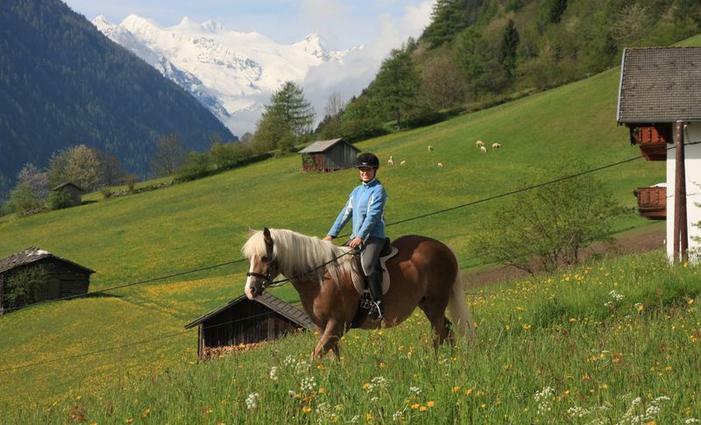 You can even explore the Stubai on the back of our horses, Fenda and Soraya. A beautiful horse-riding trip destination, for example, is lake Kampl, where you can also take a dip in summer. Of course, you can also get actively involved in our farm life: From making butter, feeding the animals, all the way to tractor rides; guests can gladly help out on the farm. Little guests are particularly enthusiastic about the farmer’s daily routines and can learn a lot about rural life at the same time. Once per week we organise a barbeque night for our guests as sociable get-together. Right behind the farm you can set out to marvellous hiking tours that take you to the most beautiful sites in the Stubaital. We are happy to rent out hiking equipment from backpack to hiking poles and orientation maps or to accompany up you the mountain. Our little guests appreciate the exciting adventures offered by BIG Family Stubai summer club, which they can join free of charge. During winter months we offer skiing courses for beginners, all the way to race training for professionals as we operate our own ski school with state-certified skiing instructors and guides. Sled runs and snow shoe hikes are equally accessible near our farm as well. At Omesbergerhof you are welcome to hire sleds and mountain bikes free of charge!